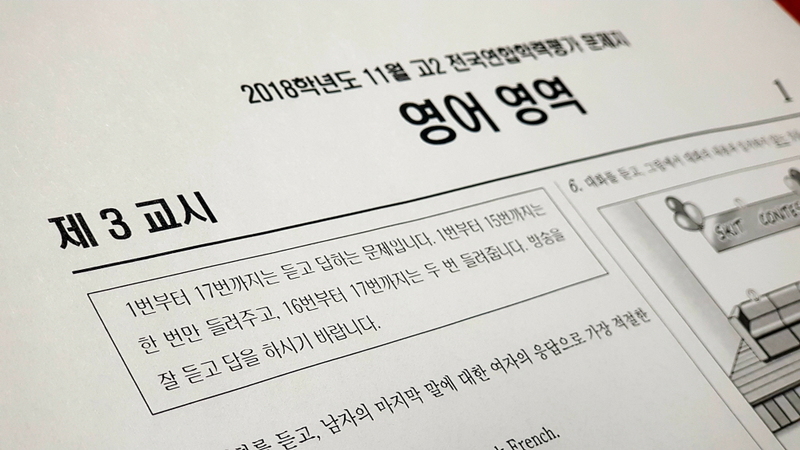 2018년 11월 21일 시행된 11월 고1, 고2 모의고사 영어 시험 분석내용을 올려드립니다. 해당 분석 자료는 목동고등영어학원 길벗아카데미 박길수 교육관님께서 수고해주셨답니다. 이번 11월 모의고사 영어 시험은 당장 겨울방학의 학습 방향을 결정하는 지침이 될 것이며 여태까지 공부해 온 과정 대부분이 출제범위에 들어갔으므로 그동안 해온 학습의 완성도를 점검해보는 기회가 되었을 것이다. 모의고사는 자신의 영역별 취약부분을 체크할 수 있는 기능이 있다. 영어의 경우 어휘가 약한 학생은 어휘력을 보강해야 하고 문법이 취약한 학생은 문법 실력을 갖춰야 한다. 이번 모의고사에서 성적이 잘 나온 학생은 자신이 실수할 가능성이 있는 고난도 문항에 대비하는 학습 전략을 짜야 할 것이고, 성적이 잘 나오지 못한 학생은 어떤 유형에서 점수를 잃는지를 판단해보고 타겟을 명확히 하는 보강학습을 통해 점수의 균형을 유지하는 전략이 필요할 것이다. 수험생들의 체감난이도는 ‘약간 어려웠다’는 응답이 제일 많았고 6월 모의고사보다 더 어려웠다는 의견도 많았다. 고1, 고2 모두 고난도 문제들이 배치되어 있어 변별력을 높인 시험이었으며 1등급자 비율이 6%를 넘기기는 어려울 듯하다. 절대평가라서 누구라도 90점 이상을 받으면 1등급이고, 80점 이상을 받으면 2등급이지만 문제의 난이도가 만만치 않아 90점이나 80점만 받으면 된다는 안일한 생각으로는 절대 원하는 등급을 받거나 유지할 수 없다. 모의고사든 수능이든 시험의 난이도, 사회적 요구의 변화, 시험당일 개인의 컨디션 등 시험과 관련된 다양한 변수들을 고려하여 평소 강도 높은 훈련만이 내 등급을 보장해 줄 수 있다는 의식과 나도 열심히 하면 좋은 등급을 받을 수 있다는 생각을 동시에 하면서 이번 시험을 계기로 앞으로 남은 기간 동안 최선을 다하기 위한 전략을 수립하면 좋을 듯하다. 이번 모의고사의 학년별 난이도 및 경향과 특징을 보여주는 대표적인 문제 세 개씩을 분석해 보겠다. The belief that humans have morality and animals don’t is such a longstanding assumption that it could well be called a habit of mind, and bad habits, as we all know, are extremely hard ① to break. A lot of people have caved in to this assumption because it is easier to deny morality to animals than to deal with the complex effects of the possibility ② that animals have moral behavior. The historical tendency, framed in the outdated dualism of us versus them, ③ is strong enough to make a lot of people cling to the status quo. Denial of who animals are ④ convenient allows for maintaining false stereotypes about the cognitive and emotional capacities of animals. Clearly a major paradigm shift is needed, because the lazy acceptance of habits of mind has a strong influence on ⑤ how animals are understood and treated. 해설: 1번은 접속사 and 다음에 이어지는 문장의 일부의 문법성을 체크하는 것이다. bad habits가 주어인데 Bad habits are extremely hard to break는 올바른 문장이다. 이 문장은 It is extremely hard to break bad habits를 변형시킨 문장으로 하자가 없다. 2번의 that는 the possibility와 동격을 이루는 동격명사절의 접속사로 올바르게 쓰였다. 3번은 주동 수일치 문제인데 주어인 The historical tendency가 단수이므로 is가 올바른 용법이다. 4번은 Denial of who animals are가 주어임을 알아야 풀 수 있는 고난도 문제이다. 뒤에 나오는 allows가 이 주어를 받는 동사이므로 그 사이에 들어갈 수 있는 말은 형용사가 아니라 부사인 conveniently가 되어야 한다. 5번의 how는 간접의문문 명사절을 이끄는 의문사 how의 용법이 하자가 없다. 다음 빈칸에 들어갈 말로 가장 적절한 것을 고르시오. 해설: 전체 글의 요지를 파악해야 빈칸에 들어갈 문장을 추론할 수 있다. 이 글은 포식자와 먹잇감을 날카로운 발톱이나 이빨 등과 같은 무기의 유무로 구별하는 것이 아니라 눈의 위치로 구별할 수 있다는 주장이다. 인간을 비롯하여 포식자는 정확한 거리 감각을 제공하는 정면 응시 쌍안경 관점을 가지는 반면에 먹잇감은 각도를 넓혀 주변 위험을 좀 더 잘 감지하기 위해 바깥으로 향하는 눈을 갖고 있다는 것이다. 따라서 빈칸에 적절한 진술은 2번의 ‘강력한 종일수록 더 좁은 시야를 가진다’가 된다. 2번을 놓치고 1번을 정답으로 고른 수험생이 많았다. 글의 흐름으로 보아, 주어진 문장이 들어가기에 가장 적절한 곳을 고르시오. The way we communicate influences our ability to build strong and healthy communities. Traditional ways of building communities have emphasized debate and argument. ( ① ) For example, the United States has a strong tradition of using town hall meetings to deliberate important issues within communities. ( ② ) In these settings, advocates for each side of the issue present arguments for their positions, and public issues have been discussed in such public forums. ( ③ ) Yet for debate and argument to work well, people need to come to such forums with similar assumptions and values. ( ④ ) The shared assumptions and values serve as a foundation for the discussion. ( ⑤ ) As a result, forms of communication such as argument and debate become polarized, which may drive communities apart as opposed to bringing them together. 해설: 보기에 주어진 문장이 However로 시작되므로 그 앞에 나오는 내용은 사회가 동질적인 사회여서 같은 생각과 같은 가치관을 가진다는 얘기가 나와야 한다. 1번에서 4번까지는 비슷한 생각과 가치관을 가진 사람들이 타운홀 같은 데 모여 토론과 논쟁을 통해 중요한 현안들에 대해 논의를 한다는 예시 내용이 나온다. 이와는 달리 마지막 문장은 토론이 양극화되어 사회를 분열시킬 가능성에 대해 언급한다. 5번의 앞과 뒤에 완전히 다른 주장을 하고 있으므로 주어진 문장은 5번에 집어넣어야 앞뒤가 안 맞는 갭을 메울 수 있다. 과반수가 넘는 수험생이 3번, 4번 답을 골랐다. Application of Buddhist-style mindfulness to Western psychology came primarily from the research of Jon Kabat-Zinn at the University of Massachusetts Medical Center. He initially took on the difficult task of treating chronic-pain patients, many of ① them had not responded well to traditional pain-management therapy. In many ways, such treatment seems completely ② paradoxical — you teach people to deal with pain by helping them to become more aware of it! However, the key is to help people let go of the constant tension that ③ accompanies their fighting of pain, a struggle that actually prolongs their awareness of pain. Mindfulness meditation allowed many of these people to increase their sense of well-being and ④ to experience a better quality of life. How so? Because such meditation is based on the principle that if we try to ignore or repress unpleasant thoughts or sensations, then we only end up ⑤ increasing their intensity. 해설: 1번은 두 문장이 컴머 하나로 연결되어 있는 형식이며 이것은 비문법적이다. 따라서 many of them 앞에 접속사 and를 더 넣거나 many of whom으로 고쳐야 문법적인 연결이 된다. 2번은 동사 seems 다음에 형용사 보어로 paradoxical이 쓰인 것이므로 하자가 없고, 3번 역시 단수 선행사와 주격 관계대명사 다음에 단수동사 accompanies가 쓰인 것이므로 올바른 용법이다. 4번은 allowed + 목적어 + to부정사구 구문에서 to부정사구 두 개가 접속사 and를 사이에 두고 병렬된 구조로서 올바른 용법이고, 5번의 increasing은 ‘~하면서 끝장을 보다’라는 숙어 end up –ing 형태가 잘 쓰인 경우이므로 역시 하자가 없다. 1번 정답을 놓친 상당수의 수험생이 2번과 3번을 정답으로 골랐다. 해설: 지문 난이도가 높았고 1번 선택지의 해석이 쉽지 않아 정답 선택에 어려움을 많이 겪었을 문제였다. 2번을 답으로 고른 수험생이 가장 많았고 그 다음으로는 3번과 4번을 많이 골랐다. 이 글은 기업의 환경보호 행동과 재정 구조 사이에 positive correlation 즉 양의 상관관계가 있다는 주장이다. 미국의 경우 한 회사의 독성 물질 배출량이 10% 줄어들면 자산 수익률과 같은 재정 구조가 평균 3% 정도 좋아진다는 증거를 제시하고 있다. 따라서 빈칸에 들어갈 가장 적절한 내용은 1번의 ‘녹색 운영이 이익이 된다’가 된다. 여기서 pay는 자동사로 ‘수지가 맞다’ ‘돈이 된다’라는 의미이다. 다음 글을 읽고, 물음에 답하시오. While complex, blockchains exhibit a set of core characteristics, which flow from the technology’s reliance on a peer-to-peer network, public-private key cryptography, and consensus mechanisms. Blockchains are disintermediated and transnational. They are resilient and resistant to change, and enable people to store nonrepudiable data, pseudonymously, in a transparent manner. Most — if not all — blockchain-based networks feature market-based or game-theoretical mechanisms for reaching consensus, which can be used to coordinate people or machines. These characteristics, when combined, enable the deployment of autonomous software and explain why blockchains serve as a powerful new tool to facilitate economic and social activity that otherwise would be difficult to achieve. At the same time, these characteristics represent the technology’s greatest . The disintermediated and transnational nature of blockchains makes the technology difficult to govern and makes it difficult to implement changes to a blockchain’s underlying software protocol. Because blockchains are pseudonymous and have a tamper-resistant data structure supported by decentralized consensus mechanisms, they can be used to coordinate socially unacceptable or criminal conduct, including conduct facilitated by autonomous software programs. Moreover, because blockchains are transparent and traceable, they are prone to being co-opted by governments or corporations, transforming the technology into a powerful tool for surveillance and control. 해설: 이 글 역시 지문 난이도가 높아 정답 추론에 실패하기 쉬운 문제였다. 이 글은 최근 큰 사회적 이슈가 되고 있는 블록체인의 속성에 대해 설명한 글이다. 블록체인은 PtoP 망과 공개키 암호방식, 합의 방식 등의 다양한 인터넷 기술을 통합한 미래지향적 인터넷 도구이다. 두드러진 특징은 탈중개적 속성과 초국가적 속성을 지닌다는 것인데 시장기반과 게임이론 성격도 강하다는 것이 또 다른 측면이다. 두 번째 단락에서는 블록체인 기술의 문제점과 한계가 지적된다. 즉, 탈중개적이며 초국가적이다 보니 통제가 어렵고 한번 정해진 프로토콜을 변경하기도 어렵다는 것이다. 또한 국가와 기업에 의해 공동 이용되다 보니 감시와 통제의 수단으로 전락할 위험도 크다는 것이다. 이런 전체적인 글의 흐름을 대충이라도 이해해야 1번의 정답을 고를 수 있었던 문제였다. 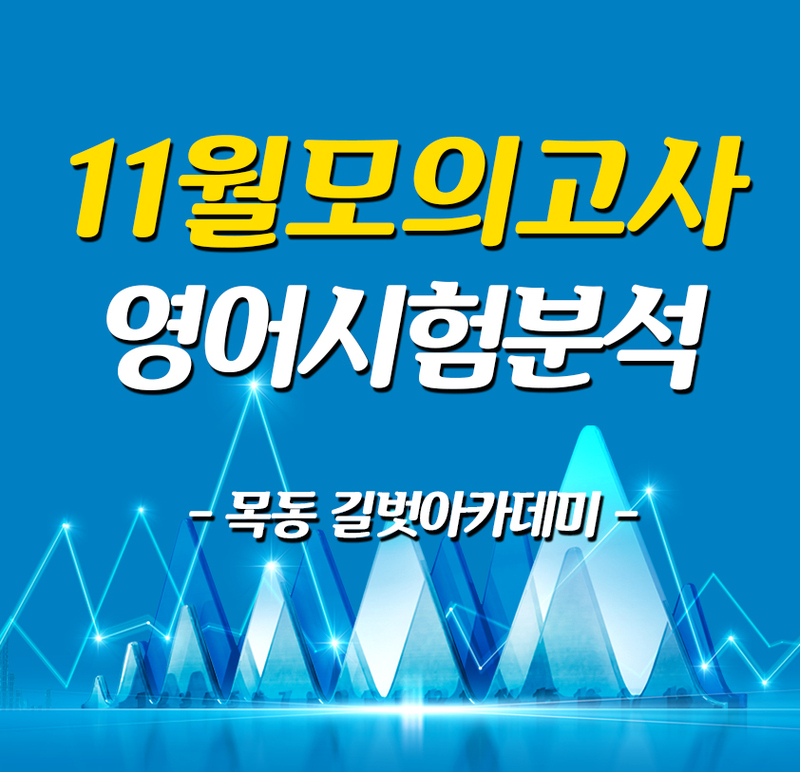 그러나 글의 흐름을 놓쳐서 4번을 정답으로 고른 학생들이 많았다. 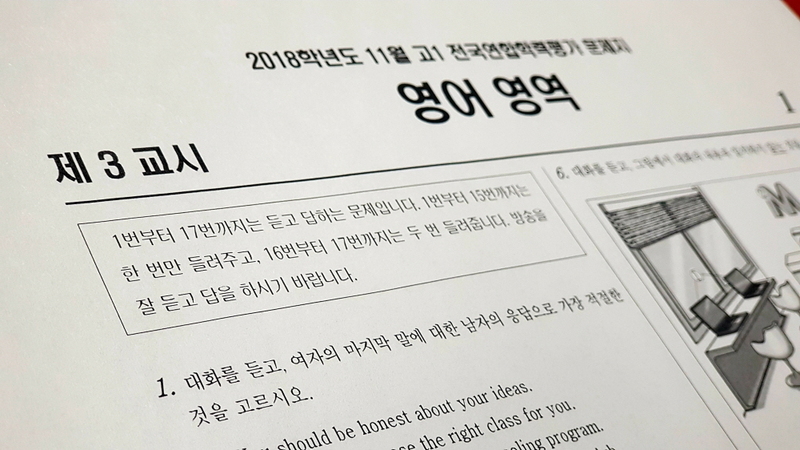 그럼 이상으로 목동고등영어학원 길벗아카데미에서 분석한 2018년 11월 고1, 고2 모의고사 영어 시험 출제경향 및 난이도 분석 포스팅을 마치겠습니다.